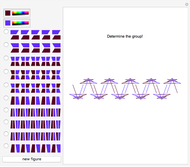 In a frieze group where the unit cell consists of two or four copies of a fundamental region, a color-change transformation can give 10 different antisymmetric frieze groups. See Part 1 for further details. L. Radovic and S. Jablan, "Antisymmetry and Modularity in Ornamental Art," in Proceedings of Bridges: Mathematical Connections in Art, Music, and Science, Kansas, 2001 pp. 55–66. archive.bridgesmathart.org/2001/bridges2001-55.pdf. Izidor Hafner "Guess the Antisymmetric Frieze Group, Part 2"